A sports reporter kept her composure and continued with her live segment despite being harassed on TV. 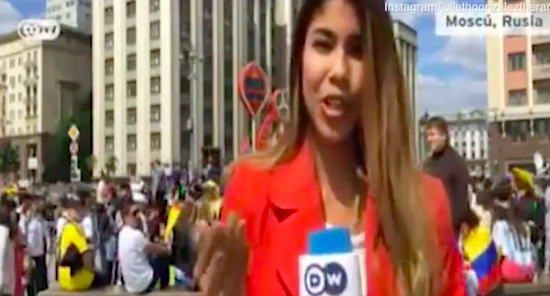 Columbian reporter Julieth Gonzalez Theran was doing a live World Cup broadcast in Saransk, Russia, for German news channel Deutsche Welle, when she was interrupted by an unknown male. The footage shows the man approaching Theran – who was explaining to viewers she was standing in front of the World Cup countdown clock – and proceeds to grab her breast and kiss her on the cheek. While the shocking incident came out of absolutely nowhere, she remained relatively calm in the situation and carried on with her report. I was there for around two hours preparing my things and nothing happened to me. But when we were live that man took advantage of it. He came at me, gave me a kiss and he touched my breast. I had to continue, afterwards I tried to see if the man was still there but he had left. We do not deserve this treatment. We are equally as professional and deserving. I share the joy of football but we must identify the limits between affection and harassment. People in the comments section vented their outrage at the unidentified male who sexually assaulted Theran on camera. These things should not happen! You are intelligent, beautiful and a great woman. You handled yourself really well but the man is a first-class imbecile and disrespectful. 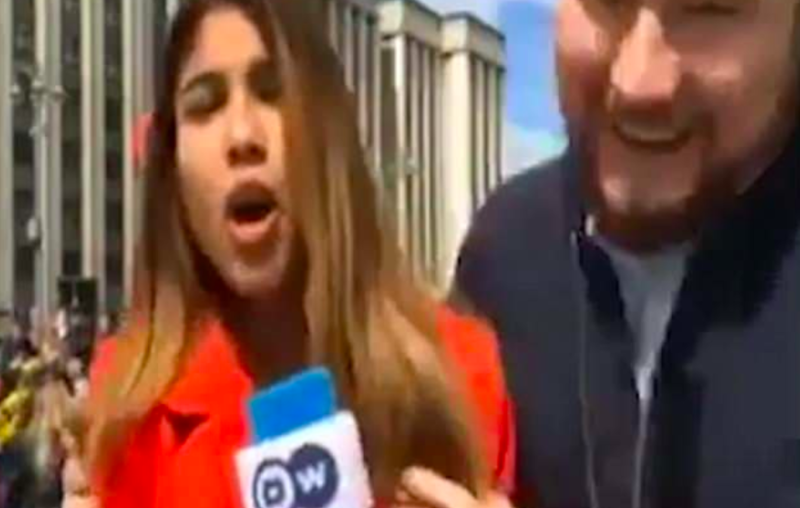 Back in May, Mexican sports reporter Maria Fernanda Mora hit a fan with her microphone after he groped her while she was reporting on a football match. During a post-match report of the CONCACAF Champions League Final between Guadalajara and Toronto FC, Mora was groped by a fan during a live broadcast. The incident occurred outside the Guadalajara stadium after the team beat Toronto. While Mora was giving her report she was joined by boisterous fans happy at their team’s victory. However, one man took it too far by inappropriately touching her. Realising what’s happened she immediately turned around and hits the man with her microphone. The fan looks stunned, presumably because he did not expect her to react in such a way and walks away confused. Soon afterwards, Mora, clearly frustrated at what just happened, walks off camera. She later took to Twitter and Instagram to defend her reasons, as well as stating no regrets for her ‘reaction at all’. I thought, It could be an accidental rubbing because of people’s pushing and I kept talking to the camera. This guy, emboldened because I did not react and kept doing my job, put his hand between my buttocks twice more. I decided to defend myself. She went on to say women ‘will not be quiet’ when it comes to the subject of sexual harassment.